The rich Bronze finished cast aluminum is easy to care for and has the look and of antique wrought iron. The tempered glass top comes with umbrella hole and removable cover. Choose which size table best suits your needs and match any dining chairs with it. 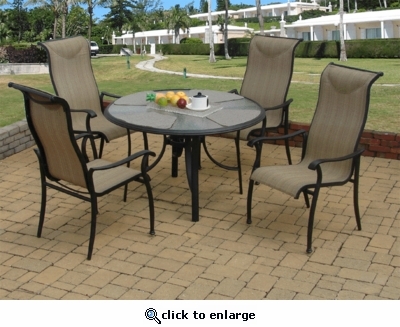 The set includes one round table and four dining arm chairs.